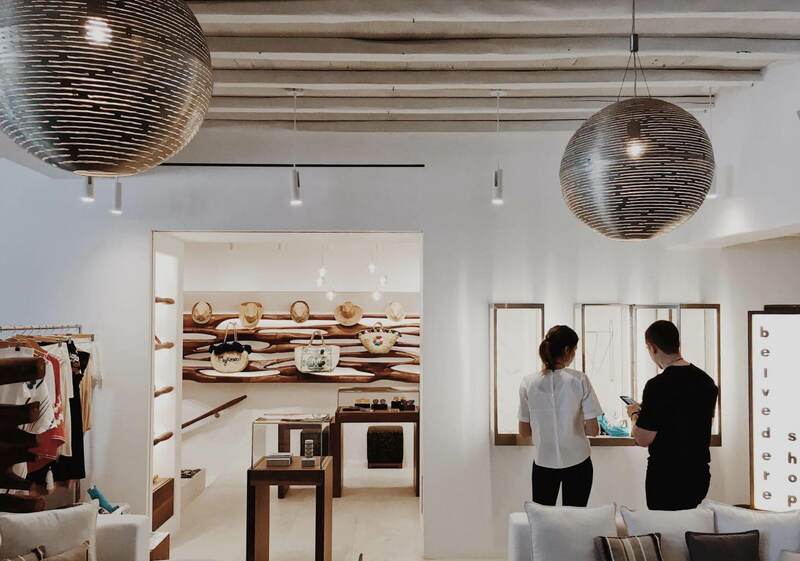 The renovated Belvedere Shop in Mykonos, in keeping with the quality and aesthetics of the hotel, offers a unique shopping experience that smells like (Greek) summer. It’s a place that stirs such intense memories, you wish you could take it with you on your way home. Like a magical summer you will always remember or a souvenir from an island you dream of going back to, again and again. The fact that Mykonos is considered a high fashion destination certainly helps. The island is practically swarming with models and designers, both regulars at the Belvedere. Even a casual stroll through Matoyannia can feel like walking onto the set of a fashion editorial. The hottest trends, the most covetable fashion items and the most eccentric crowds will parade right before your eyes. The cosmopolitan sensibility of the island was one of the many reasons that led to the inauguration of a high-end boutique inside hotel premises. The Belvedere Shop offers guests and itinerant visitors an eclectic shopping experience unlike any other. This is the best place to pick up a new bathing suit that happens to go with your current mood, buy a handcrafted beach bag from an emerging designer or select a piece of jewelry for someone you just can’t stop thinking about. On 2017, the Belvedere Shop was fully renovated and forms an integral part of the hotel, complementing the various other services and amenities on offer. The new concept is inspired by Mykonos town, a place where every single business - be it a boutique, a bar or a café – are in constant communion. An opportunity to expand your social horizons is just around the corner. You can run into a friend, stop for a drink or even chat with a stranger. Energy flows like a river and that’s exactly the kind of spirit the new Belvedere Shop is based on. Although it remains faithful to the unifying Belvedere aesthetic, it can’t help but grab your attention. It almost feels like a little piece of Mykonos, an extension of the Cycladic summer. The colors and the textures call out from afar, although the display cases are the first thing you’ll notice: a universe unto themselves, they’re a testament to the island’s age-old tradition in goldsmithing and jewelry design. Once you’re past the entrance, you’ll get a chance to peruse and shop a well-curated selection of Diane Kordas, Zeus + Dione, Ancient Kallos, Muzungu Sisters, Callista Crafts, JPM, Themis Z, Solid and Striped, Marie-France van Damme, Bluemint, La Vie, Mykita, Di Gaia and more. The vast majority are Greek designers complemented by a tight selection of foreign brands that stay true to the spirit of the island of Mykonos. New York swimwear Solid and Striped is a characteristic example, a brand that’s both timeless and elegant, a favorite with Poppy Delevingne, Gigi Hadid, Cindy Crawford and Joan Smalls. Each and every piece makes for a perfect poolside outfit. Ancient Kallos is another recent addition of high-end resort wear combining quality and affordability, which pretty much makes it the best wearable souvenir ever. Nothing screams out Greek summer like the perfect kaftan and nobody does it better than the Belvedere Shop!